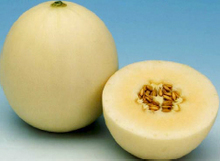 Very early netless melon, potential high yields, with good storage quality. Pure white exterior, turning to a beautiful Ivory at maturity. Weight more than 1100g, brix of 15 - 16%.